Gaur are large herbivores found throughout the Indian subcontinent. In recent years, increasing numbers of gaur are moving through the town of Kotagiri for the first time since humans settled there. Gaur are known to attack people when provoked and can kill people. Although there are records of gaur straying into urban areas from as early as 1922, only in recent years have gaur routinely lived in human-dominated landscapes. Discussing gaur populations throughout the Indian subcontinent, Choudhury wrote “conflict between gaur and humans is not a serious conservation problem. It is mainly confined to some crop depredation, especially in the forest villages and encroachments.” (2002: 214). Something seems to have changed since. In parts of Kotagiri—a town of over 35,000 residents rather than a “forest village”—gaur appear daily, and human-gaur conflict looms large in many people’s minds. 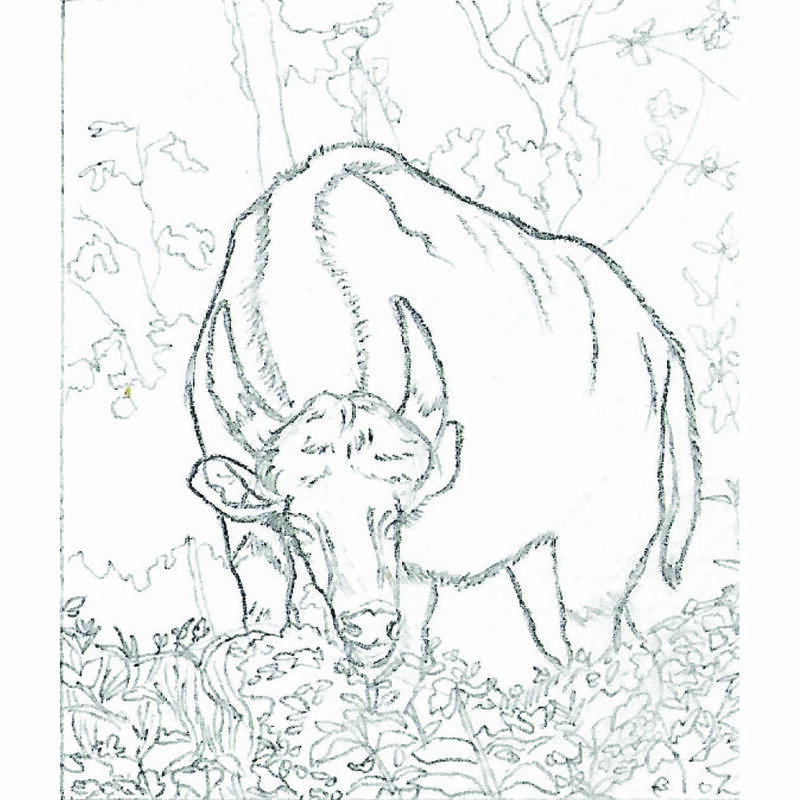 People tell stories of gaur eating their garden plants, damaging their property, injuring people, and in a few extreme cases, killing people. The threat of gaur causes people to change their behaviour to stay safe—foregoing walking at night, for example. Other small urban areas close to forests are reporting similar experiences, and the intensity of human-gaur conflict is increasing. During interviews, residents of our study area often expressed dissatisfaction with the current state of human-gaur interaction and frustration at the lack options for dealing with the issue. Studying gaur’s interactions with human settlements in a small urban area such as the valley shown in Map 1 has the potential to illuminate gaur behavioural patterns in response to human intervention on the landscape. 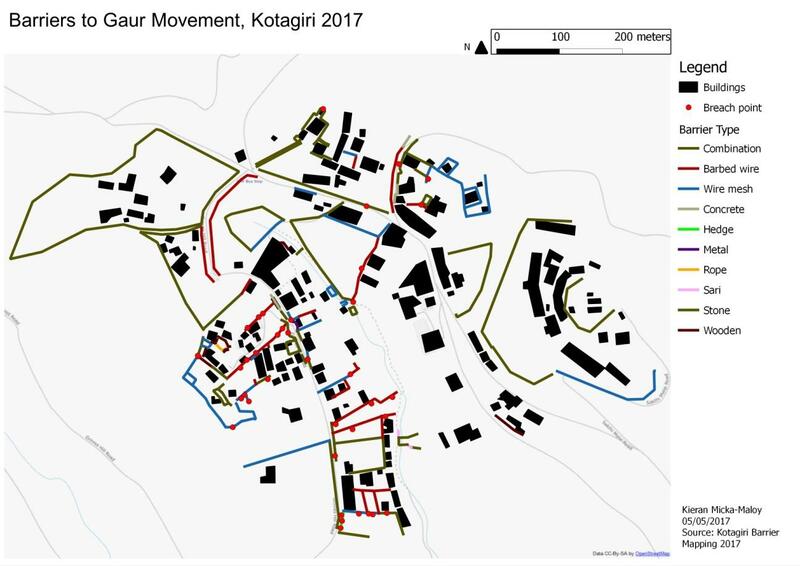 Through gaur monitoring, stakeholder surveys, and mapping land use, fences, and other structures, we gathered results that speak to the relationship between humans and gaur in Kotagiri (see Map 1). We conducted 40 interviews of people in Happy Valley, a semi-urban settlement in Kotagiri, hoping to gain insight into how often gaur travel through the area, how people perceive gaur, how people interact with and take precautions against the animals, and how land use in the area has changed in recent years. We conducted our interviews by approaching homes and businesses within the study area, and interviewing willing adults who either lived or worked on the property. For stakeholders with man-made barriers on their property, we asked an additional set of questions about how and why they built their barrier. The relationships shown in Figure 1 are drawn from the results of our field research. We start outside of the city, in the forest. One man painted a particularly bleak picture of the state of the forest: “even with restrictions, people are still cutting trees…many gaur are starving. There isn’t enough food for them. Gaur need 100 liters of water per day, but the environment cannot handle that.” In degraded environments, gaur are often attracted to the areas that also draw people, and for the same reasons: the presence of food and water sources. People we surveyed in our study area see gaur herds on average about five days per week. While there is nothing inherently negative about human-gaur interactions, they can lead to conflict. From the proliferation of fencing, largely built to keep gaur away (Map 1), to people’s perceptions of gaur, the concern with conflict was clear. Results of this conflict can range from the relatively benign, like someone being unable to put out laundry because a gaur is in their yard, to the extreme, like death. We found that more than 60% of our respondents consider gaur problematic. The conventional wisdom is that conflict flows naturally from the interaction between these two species, and we certainly found that to be the case in our study area. From conflict flowed short-term solutions, meant to manage gaur’s presence in people’s lives. These solutions range from shouting and throwing rocks to drive gaur away to staying inside whenever a gaur comes into one’s yard and putting up fences to keep them out. These solutions do nothing to stop human gaur conflict (HGC) in the long term, and most are not very effective at avoiding conflict in the short term either. Furthermore, many of these solutions create more HGC, feeding into a cycle. For example, when someone throws a rock at a gaur as a short-term intervention to make it leave their property, the gaur may become injured, scared, and angry, making the gaur more erratic in the moment, more fearful of humans in the long term, and overall more likely to cause conflict. One woman told us of an incident where some men were chasing a gaur away by throwing stones at it. The gaur started running across a narrow path above her house to escape. It slipped on the slope and fell onto her roof while she was inside the house, causing serious damage to her home, and then ran away, breaking all of her fences on the way out. While the men only intended to make the gaur move on, they ended up causing much more damage than if they had let it be. Stories like this are common throughout our study area, and problematic—because chasing gaur away by either making noise or throwing rocks was the most frequent response when we asked people what they do when they see a gaur. The repeated use of short-term solutions also leads to a sense of frustration and helplessness among communities struggling to manage their interactions with gaur. We found that use of such ineffective solutions as yelling at gaur and throwing rocks at them to drive them away seems to make it more difficult for residents to imagine effective long term solutions to the problem. The two most popular answers when asked how to deal with the issue of gaur were that the Forest Department (FD) should solve the problem and “I don’t know,” neither of which show confidence in communities’ own ability to effectively manage gaur. This also ties back to the role of the FD, which has little history of working with communities in human-dominated landscapes, but is nonetheless seen as the only actor equipped to deal with wildlife by many stakeholders surveyed. Building barriers is another response to the frequent presence of gaur. In Figure 1, we drew two arrows heading out from gaur. The arrow to the left represents what happens when barriers are effective at keeping gaur away. Gaur are successfully deterred from entering human areas, but we do not know where they go instead. Since their traditional habitats are being destroyed, barring them from towns and cities could leave them vulnerable. Future research and conflict management strategies must cross this rural-urban divide, taking into account effects on gaur in both landscapes. The arrow to the right leads through the barrier, representing what happens when barriers are non-existent or ineffective. Ineffective barriers lead to new conflict. The animal might be injured trying to cross, and people incur a monetary cost when they either fix the barrier or build a new one. Our research indicates that effective barriers can be good investments in certain contexts; however, barriers that gaur can jump over or ones that gaur break regularly provide little to no deterrence for the animals. This is concerning, as both our barrier mapping data (Map 1) and our survey results showed that even though gaur deterrence is the main reason people build barriers, ineffective ones, predominantly made of wire mesh or barbed wire by small landholders, have proliferated around Kotagiri. In our study area, as Map 1 shows, disconnected and spread out small residential development is interspersed with open areas of tea cultivation that gaur can easily move through. Large landholders (typically institutions), in contrast, have the resources to build effective barriers to make their campuses gaur-proof, building sturdier fences that are often a combination of stone, concrete and other materials. In doing so, they further channel gaur into smaller landholders’ spaces. As of now, there are still unbarricaded pathways that gaur use to access food, water, and resting areas, but this could change as more fences are constructed. We spoke with one man, for instance, who said he kept a lawn next to his house unfenced because it was one of the only ways gaur could access a water source from the forest. But this man is considering selling his land to housing developers. One thing that is abundantly clear is that there is no coordination between individual landholders to try to accommodate gaur movement, or even to agree on an effective way of keeping them out. 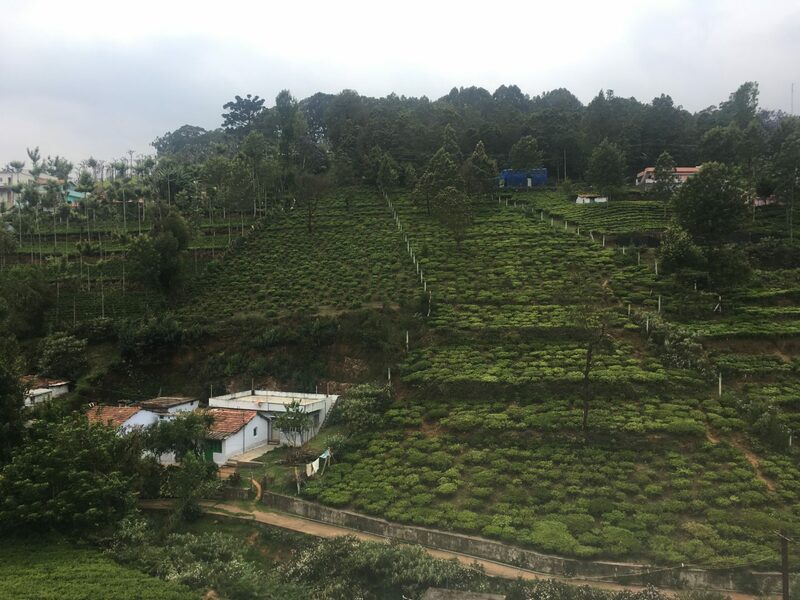 The final component of our research looked at potential solutions to Kotagiri’s HGC, looking at governance, land management, and urban planning solutions, and drawing on national and international examples. We found that by combining ecological and social aspects of land use planning, cities can reduce habitat fragmentation while bolstering their residents’ security and empowerment, thus creating mutually beneficial outcomes for both animals and people. One way to reduce HGC is to focus on improving governance. Elliot & Molles (2016) argue that educating people about how to live amidst wild-animals is more important than managing animals themselves. Nepal’s equivalent of the FD partners with NGOs with sociological expertise and community connections. It has instituted a popular program that educates communities about crops to plant that do not attract elephants. Besides educating people, government should also work with communities to implement human-wildlife management solutions. India’s Elephant Task Force plan provides funding for communities to set and implement yearly elephant conflict-related goals in tandem with the government’s own interventions. By incorporating the Kotagiri community into planning processes and educating them on good practices for dealing with gaur, the FD could greatly reduce HGC. Land use planning also offers solutions to HGC. Habitat fragmentation, which forms ecological traps that prevent animals from returning to the wilderness, causes human-wildlife interaction. Once habitats are fragmented, there is little chance of un-fragmenting them. To prevent habitat fragmentation, planning must shift to focus on ecological landscapes (and how cities affect them), rather than focusing only on urban areas. Wildlife corridors (WCs), connecting disparate habitat fragments with linear protected natural areas that animals can travel through, are one popular ecological planning intervention. Corridors can serve as tools not only for conservation, but also for natural education and recreation. Animals have been shown to utilize WCs for their intended purpose, but corridors are expensive to implement because they require buying large amounts of land, competing at market prices with more lucrative uses. In Kotagiri, corridors might connect forest areas where gaur rest with water sources, but potential paths are fast disappearing due to development. Smart Growth policies, which advocate channelling development into dense and compact areas, would aid WC implementation. Smart growth decreases human wildlife conflict by reducing the land area used by humans, thereby both conserving natural areas and reducing zones of interaction between natural and urban areas. A major take-away from our secondary research is that coordination is necessary for any of these long-term solutions to be implemented. Given the mostly negative relationship between people and gaur in Kotagiri, such coordination is sorely needed, but it is often lacking. Our interviews and mapping showed that many individuals build poor quality barriers or throw rocks at gaur as short term solutions to HGC, which only exacerbate the problem. Meanwhile, the FD lacks the expertise required to work productively with the community. India’s large informal economy makes coordinated planning efforts more difficult, but the Elephant Task Force plan, which works with communities to implement long term landscape planning interventions, shows that it can be done effectively. If a similar long range plan were implemented to manage human-gaur interaction, Kotagiri would see greatly reduced HGC, and improved living conditions for both people and gaur. Prasath. G lives in the Gudalur Valley, Nilgiri Biosphere Reserve. He had completed 12th grade and is now graduate of the NFLC class of 2017. He continues to pursue his studies and is doing BSc from the Government Arts and Science College, Ooty. Choudhury, A. 2002. Distribution and conservation of the Gaur Bos gaurus in the Indian Subcontinent. Mammal Review 32(3): 199-226. Boequilha Leitao, A.and J. Ahern. 2002. Applying landscape ecological concepts and metrics in sustainable landscape planning. Landscape and Urban Planning 59:65-93. Boone, R. B. and N. Thompson Hobbs. 2004. Lines around fragments: effects of fencing on large herbivores. African Journal of Range & Forage Science 21(3):147-58. Dickman, A. J. 2010. 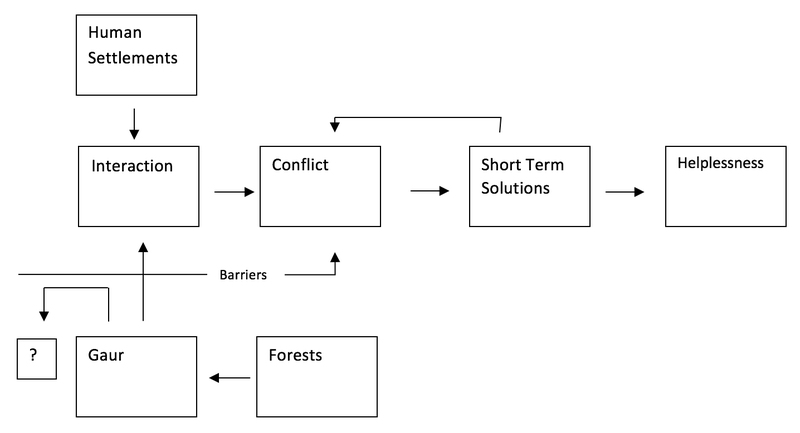 Complexities of conflict: the importance of considering social factors for effectively resolving human-wildlife conflict. Animal Conservation 13(5): 458-66. Map 1. Barriers to gaur movement in the study area.